Twitter recently informed me on the passing of Yasmin Ahmad, and I was confused for a minute because I had never heard of the person, which made me feel kinda low. So I did some backtracking. 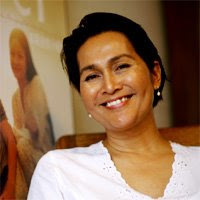 Yasmin Ahmad was a Malaysian Filmmaker, Screenwriter, and Director, who gained fame for her artistic films and even shot many successful commercial campaigns. Ahmad passed away after suffering a stroke and brain hemorrhage during a presentation. It sounds so tragic. I'll say it again, I just feel bad that there was someone, who was so well known for her art in the world, and I had never heard of her. So don't let this happen to you. Watch lots of movies, listen to lots of music, and read tons of books, even more than you do now. You can never like too many artists. Tonight I guess I'll be going to the foreign film section of the video store and see if they carry any of her films.